The correct positioning for the seat belt anchorage is mid-shoulder height. To adjust it, pinch the control and slide it in the desired direction. 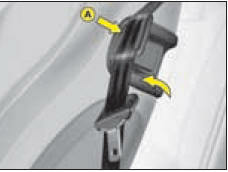 Raise then lock part A, to retain the seat belt buckle when it is unfastened. It is necessary to remove the seat belt from the buckle retainer before moving the seat to access the rear seat positions. As a safety measure, these operations should only be done at standstill. When the pretensioners are deployed, there is a light discharge of harmless smoke and a loud noise, both due to the detonation of the integral explosive cartridges that activate them. Depending on the nature and the force of the impact, this triggering may happen prior to, and independently of, the deployment of the airbags. In all cases, the airbag warning lamp comes on. Legislation makes it compulsory for all the vehicle's occupants to wear seat belts, including pregnant women and however short the journey. Inside the cabin, the seat belt is the most important protection for passengers. A warning lamp informs you if the driver's and/or front/rear passengers' seat belts are not fastened, when the ignition is switched on. In the event of a collision or on emergency braking, the seat belt will hold you in your seat, preventing you from being thrown from the vehicle. The pretensioners pull back the front seat belts. The occupants are thus held more firmly against their seats. The force limiters reduce the pressure of the seat belt against the occupant’s chest, thus enhancing the protection that the seat belt provides. Seat belts and pyrotechnic pretensioner systems They must be replaced following a deployment, preferably by a CITROËN dealer or by an authorised repairer. Due to the safety regulations in force, any check or any replacement should preferably be carried out by the CITROËN network which guarantees the work and ensures that it is done correctly. Any repair that is not done in strict compliance with requirements could result in the systems operating incorrectly or randomly, with the risk of bodily injuries being caused. Pull the belt down in front of you in a steady movement, making sure that it does not become twisted. Press the fastening into its buckle. Check that the seat belt has fastened correctly and that the automatic reel lock is working correctly by pulling the strap. The abdominal part of the strap should be positioned as low down as possible in the lap and as tight as possible. The chest part should be positioned if possible in the channel of the shoulder. Each belt has a reel that adjusts its length automatically to the girth of the seat occupant. Press the red button on the buckle to unfasten the belt. The belt retracts automatically when not in use. Must be able to restrain a single person of adult size. Must not bear any signs of being cut or frayed. Do not swap buckles, as then they would not fulfil their proper roles. Before and after use, make sure that the belt is correctly retracted. If the seats have armrests, the central part of the belt should pass underneath. Position the lower part of the belt as low down as possible on the lap, so that it exerts no pressure on the abdomen. Always adjust your seat belt while the vehicle is stationary. The driver must ensure that all the passengers have correctly fastened their seat belts. Do not pass the belt over hard or breakable objects that you may have in your pockets. Never use clamps or clips to loosen your seat belt. Never carry a child on your knee. Regularly check the condition and cleanliness of the seat belts. See "Maintenance". Have the seat belts checked periodically by a CITROËN dealer as well as after any accident, even a minor one.